You remember that a Family of Grave Diggers was specifically built to enable easy modding right? So today I’ll start talking about how you can dive in and mod the game! right click and select ‘Properties’. If you bought it elsewhere then I can’t know where it’s installed but as you most probably launch the game with an icon, do this! 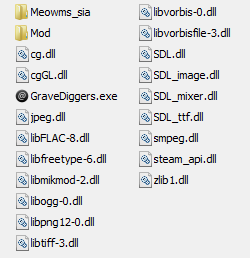 If you don’t have an icon, then you’ll know where GraveDigger.exe lives, just open that folder. Found it? Phew! Lets copy it over somewhere so we won’t meddle with the ‘original’ game files as it will be overwritten by any new Steam update for example, so go up one level and copy the folder [a Family of Grave Diggers] somewhere else on your computer. This is the root folder, and it’s filled with terrifying files mortals shouldn’t meddle with (just kidding) but don’t fret, we won’t touch anything in there with the exception of the ‘Mod’ folder and eventually, save files. And of course launch the GraveDiggers.exe to check out our newly brewed mod! Doesn’t seem like a lot eh, but here we actually have all the nifty things that we’ll want to modify or add to. Or delete if there is something you dislike! music : hmm hmm ta daaa! sound : Bang crash, sound effects here! Follow me to part two then! This entry was posted in DevBlog and tagged FOGD, mod, moddable, roguelike by Valmond. Bookmark the permalink.